That's it! I hope you'll join me in writing and abhanga this week. Please share a link to your poem or the poem itself in the comments. Exams have ended, graduation is over, and summer school has already begun. Apparently, there is no rest for the weary. I am heartbroken for a friend who has lost her son and have been struggling to find the right words. I suppose in times of loss there are no words that are "right," but hopefully there are words that express the depth of my sorrow for her and the support I am sending across the miles. Form feels a bit restrictive this week, so I'm thinking poems of love and light would be good. I hope you'll join me in writing this week. Please share a link to your poem or the poem itself in the comments. The Poetry Sisters are back this month writing "Things to Do" poems. Laura chose this month and gave us the added task of writing to a month or season. When I sat down to brainstorm, I kept thinking about winter in Buffalo, but decided I wanted to write about something a bit more cheery, so I decided to focus on spring. Little did I know that my second round of brainstorming would take me to May and a month that brings me both great joy and great sadness. The poem wrote itself on a run one morning. I actually cut it a bit short to get home and write the words down. It doesn't follow the "rules" at all, but I'm in the midst of grading and graduation and just haven't had time to revisit. Today, my father would have been 91 years old. On Sunday as the graduates walk across the stage, I'll quietly mark the 8 years since his passing. Then on the 10th, my mother will recall the nearly 57 years they had together, as she marks what would have been their 65th wedding anniversary. 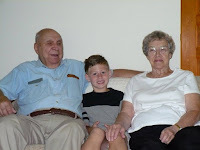 I tried to find a picture of them together to share, but couldn't find many because dad was always behind the camera. Here's one I took of them with William from the summer of 2008. Here's my poem for this month's challenge, offered up today for my dad. the happy, the sad, the me and you. Poem ©Tricia Stohr-Hunt, 2017. All rights reserved. You can read the poems written by my poetry sisters at the links below. I do hope you'll take some time to check out all the wonderful poetic things being shared and collected today by Jama Rattigan at Jama's Alphabet Soup. Happy poetry Friday friends!